Having trouble deciding between Apple's thin-but capable 13-inch MacBook Pro with Touch Bar and the powerhouse 15-inch MacBook with Touch Bar? 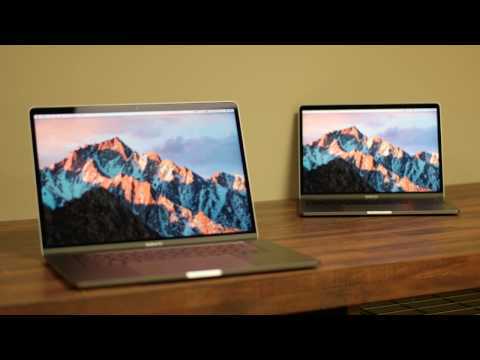 AppleInsider breaks down the pros and cons of each variant in this head-to-head comparison video. This is a comparison between a 15" and 13" model of the same computer that does not mention available screen resolution? Perhaps try to avoid use of the words "powerful", "beautiful" and "plenty" outside of a marketing (advertisement) context. It would also help to compare the weights, dimensions, noise and heat dissipation to more common objects. Then there are issues concerning relative battery runtime/charger size/dock power, MSI-stream-stitching, contrast/reflectivity under different light conditions, etc. If you cannot see the individual pixels then isn't the resolution irrelevant? It's the size that defines them. I'm not looking it up, but isn't the pixel density the same? One of the better videos I've seen you make. Keep it up and I'm sure the sky's the limit. I'm with a similar opinion -- resolution greater than you can see means you can't discern the difference visually. It does make a difference on cost, energy usage/battery life, and graphics response. But the marketing folks jump all over that "we have better resolution than the competition." Why not make them 1 micrometer pixels if you could? Because that would be a total waste. Bit off topic but it would be interesting whether next revision of 12" MacBook will get Touch Bar as well. It would make it more compelling I think. I know the 13 inch tested had the i7 but was it running 8 or 16gb for the movie test? ...I'd enjoy seeing an external bluetooth backlit keyboard with touch bar, 'for the rest of us'...? Yes. I find the placement of the touchbar to be a great use of the space but not where I could see the ergonomics winning me over.